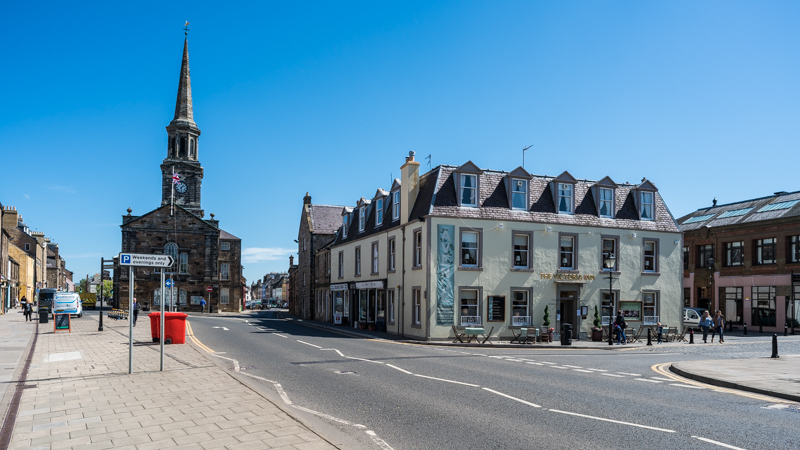 A Royal Burgh, the town of Haddington has plenty going for it, including historic places of interest and lovely little shops – we can easily spend an entire day just wandering around and seeing what’s new. We’ve come to think of Haddington as a great place to base yourself for a break away, as it just happens to be equidistant between Edinburgh and the stunning East Lothian coastline (where you’ll find some amazing award-winning beaches!). And while you’re here, it’s a lovely area to wind-down and relax. It’s also particularly great if you’re into golf, or for just stopping for a bite to eat – with plenty of charming independent shops, restaurants and cafes! So, for a fuller picture of exactly what you can expect from a visit to Haddington, check out our guide below. As the largest parish church in Scotland, St. Mary’s has survived a lot over the years, yet it’s been lovingly cared for, maintained and restored in order to continue welcoming pilgrims who make their way to visit from all walks of life. The inside is quite spectacular, and contains the early 16th century Lauderdale Aisle. The church is involved in various events and aims to keep the community spirit alive, so whether you want to get involved in crafting, sing carols, or just pop in for a cuppa and a chat, everyone’s welcome! For more information, visit the official St. Mary’s page. Once a main route into the town of Haddington, Nungate Bridge dates from around 1550, is 30 metres long and is made up of three red sandstone arches. Over the years, it’s been utilised by numerous invading armies, and mainly serves as a pedestrian bridge today (no fighting please!). Rather gruesomely, a single iron hook remains in one of the arches, that was actually used to hang criminals! The masons’ marks on the sandstone seem to suggest this version of the bridge was constructed from old ruined parts of St. Mary’s Church. It’s particularly fun to walk over the bridge and imagine all the different people who have walked the exact same route before you – you and your family can even pretend to be an invading army! And you can learn more about the Scottish minister, theologian and writer at the next place of interest, below! Learn history at Haddington’s heritage hub! The John Gray Centre in Haddington is a fantastic museum and library that always seems to have something fun going on for all the family. From summer reading challenges to film appreciation club and family history day, you’ll be sure to find something your kids will love taking part in. Plus, you can also browse the various exhibitions, and collections in the galleries. Find out what’s on at the John Gray Centre by visiting the official website and checking the full programme of events. Finally, on Haddington High Street, you’ll find a rather distinguished looking memorial monument to George Hay, VIII Marquis of Tweeddale, who was a celebrated soldier and Lord-Lieutenant of Haddingtonshire. This monument was erected in 1880, four years after the Marquis’s death in 1876. And if you take a closer look at his stone bust, you’ll see he was quite a handsome chap! There we have it! With such a rich history, there are various intriguing spots of interest to check out in Haddington, including Scotland’s oldest bridge, and a heritage hub with a full programme of fun and family-friendly events! Are you ready for an adventure the likes of which you’ve never experienced before? Are you into watersports and other outdoor activities that are just a bit different from the norm? If so, Foxlake Adventures in Haddington could be right up your street! We highly recommend getting on down to Scotland’s first wakeboard park and find out for yourself what all the fuss is about! After all that activity, you’re going to need to refuel – just as well there’s a café, then! Even better, Boardside Café has won an award as ‘The Best Eaterie within a Visitor Attraction in East Lothian 2014’. There’s some great grub available, from breakfast all the way to top “posh nosh”, and with renowned hot chocolate and a state-of-the-art coffee machine, you’ll be sure to find something to tickle your tastebuds. If you love a spot of golf, you make a point of heading over to Haddington Golf Club on your visit – Haddington’s very own 18-hole golf course! Founded in 1865, it’s an undulating parkland course with beautiful views, set over 130 acres by the River Tyne. This tree-lined course contains quite a few bunkers, however there’s not many hills, so it makes for quite a relaxing walk. Don’t get too distracted, though – according to the brochure, this par 71 course is “a test for all levels of golf”. Facilities include a putting green, practice area, trolley and buggy hire, shop, changing facilities, restaurant and lounge/bar, and tuition available upon request. To find out more, check out the official website. Play on a giant dragon! Okay, this one’s more for the kids, but the Jabberwocky Soft Play centre in Haddington is conveniently located across the road from the John Gray Centre – which is perfect if you have young kids who’d rather be playing and climbing than learning about historical events and figures. The Jabberwocky is home to a large dragon play structure, with room for up to 60 kids! There’s also a toddler area and specially designed baby area, too. Adults can relax with a coffee and some simple, wholesome food away from all the excitement. For more information on what you and your little ones can expect, check out the official Jabberwocky website. Being so close to the River Tyne, there are plenty of interesting walks in and around Haddington. You may even get to spy Hailes Castle, John Knox’s birthplace, Poldrate Mill, and the monument to the Marquis of Tweeddale on some of your routes. The East Lothian Council website has a colourful walking guide highlighting some of the best walks in and around Haddington, so you can plan your journey from there! East Lothian is a fantastic place to go for a cycle, especially if you just want a leisurely, relaxing afternoon, or a day out with all the family. There’s not a lot of hills, which makes it easy for novices and children, but you can still enjoy some marvellous scenery along the way. The coastal road is a firm favourite of ours, with some lovely views across the Forth, as you make your way through various little coastal villages. Alternatively, you may want to head inland, all the way to the foot of the Lammermuir Hills. Check out the Visit East Lothian cycling page for more information. Especially if you like to be active, East Lothian has all sorts of fun activities on offer throughout the year! Whether you’re into cycling, wakeboarding, segways, ropes challenges courses, or more relaxed activities such as walking or golf, you’ll surely find something that’ll keep you occupied! Offering a huge choice of flooring and furnishings, Norman T. Craig Home Furnishings pride themselves on offering “everything a house needs”, with fantastic quality service. So, if you’re fond of that new carpet smell, or want a change of scenery in your home, this is the place to come! Here you’ll find a wide range of carpets, vinyls, tiles, and wood flooring, along with fabrics, curtains, blinds and upholstery – and all the advice you need, from passionate staff! If you have a sweet tooth, you’ll find Betty’s of Haddington to be right up your street, with over 100 jars of old-fashioned sweeties on offer. As Haddington’s only independent sweet shop, Betty’s caters for children and grown-up children alike! Not only do they have a massive range of sweets, you’ll also find S Luca Musselburgh ice cream in-store, along with a full range of Walkers shortbread – and even handmade chocolates! The only problem here is, how do you choose?! Visit the Betty’s of Haddington page via Visit Haddington to find out more. Next we have Haddington’s local Interflora florist, Erica’s. You can order from a wide range of fabulous floral arrangements and gifts to pick up or delivered. This wee florist has been running since 1979, and it’s perfect if you’re visiting friends or family and need grab a celebratory bouquet! Take a peek at Erica’s official website to learn more. Offering “real clothes for real women”, Ivory is an independent clothing boutique offering an eclectic range of designer, casual, smart and evening wear. Everything is picked out carefully by owner Susan, who has built up a reputation for delivering outstanding quality items. The prices are affordable, too! The main aim of Ivory is to make you feel stunning, without breaking the bank. Interested in what Ivory Clothing has to offer? Check out the official website for more info. Family-run business J.S Main & Sons has been providing quality goods to the town of Haddington since 1926 – and originally made quality horse saddles! Nowadays, they also stock hardware, tools, outdoor sports equipment, pet food, ammunition, saddles and tack. What’s lovely about this shop is that they listen to their customers and respond by sourcing the highest quality products for their specific requirements – and not forgetting the superb customer service! These guys are always a pleasure to deal with. For a better idea of what you’ll find here, visit the J.S Main & Sons website. Footlights Dancewear, now branching out with Feet First, is a much loved and well-respected dance footwear specialist. They remain family-run, and are fully trained in Start-Rite shoe fittings, so your little ones can get off on the right foot when it comes to learning professional dance! Footlights also stocks RAD-approved dance uniforms and leotards! At Feet First, you’ll also find a lovely range of back-to-school wear, so even if your children aren’t quite into dancing yet, you can still pick up a gorgeous pair of new shoes! For more information, check out the Footlights website. Selling all the usual items for your home, kitchen and garden, Irvine’s home hardware is your go-to for everything DIY-related. Here you’ll find top branded paints, electrical accessories, lamps and hardware, along with security and key-cutting services. You can also buy Calor gas. If you’re a keen gardener, you’ll probably find yourself most at home in the garden section, where you can buy all sorts of equipment and tools, along with bits and bobs such as seeds, spring and autumn bulbs, plants and garden furniture. For a better idea of what you’ll find at Irvine’s, visit the official website. If you love to get out on your bike (and as mentioned above, Haddington is a great place to do just that), then Mike’s Bikes could be the perfect stop-off point to prepare you for plenty of fun journeys ahead! Mike is passionate about his bikes, and has been a bicycle mechanic for over 20 years. Even better, Mike is in-store to provide all the sales and servicing you need, and his knowledge and expertise will always ensure you feel in good hands. Here you’ll find a fab variety of products to suit the entire family! To learn more about Mike’s Bikes, hop on over to his Google Plus page. With so many lovely independent shops in Haddington, I could easily spend an entire day just walking around and browsing through what’s on offer. The above is only a selection of what you’ll find, so get ready to shop ‘til you drop! Perfect if you or your little ones have spending money. The Golf Tavern on Bridge Street has reached the top ranking on TripAdvisorfor a reason; with glorious afternoon tea, friendly staff and food freshly prepared on the premises, it cannot be faulted. It’s family-run, and some of the best pub food you’ll find in Haddington. Positioned right on the main street, The Avenue Restaurant is run by award-winning chef Craig Hunter and his wife Kirsty. Staff are particularly friendly, and the food is outstanding, as reflected in the reviews. If shellfish is your thing, you’re in for a treat – I’d highly recommend the scallops and mussels in particular. The food at the Eastern Eye is simply amazing – some of the best Indian food I’ve ever had. With friendly staff, a lovely atmosphere and beautifully-kept premises, I find myself coming back here time and time again. The extensive menu ensures there’s something for everyone, and they use only the freshest ingredients in their food. The Pantry is another firm favourite, and home to some of the biggest scones I’ve ever seen! You’ll also find homemade soups and cakes, and if there’s anything on the menu you’re not too sure about, just ask the extremely helpful staff who will do their best to make you feel at home. Highly recommended. A favourite for weddings and formal affairs, MaitlandField House is surrounded by beautiful grounds, and has a lovely conservatory area within its restaurant. I love sitting in the big, comfy armchairs and admiring the décor, but enough about that – let’s move onto the food! The Brasserie offers a more casual dining experience, with some absolutely delicious modern and classic meals on offer. Food is prepared using fresh local produce, sourced from carefully selected suppliers. Last but not least, the pub grub, along with its central location, makes Tyneside Tavern a great choice for a casual lunch out. Tyneside offers ‘small plates’ for those in the mood for an impromptu snack or light lunch, whilst their main dishes and sides provide more substantial comfort food you’ll love. Bit of a mix of contemporary and classic dishes, with a good variety on the menu. If getting a good meal is one of your top priorities on a day out, you’ll be spoilt for choice in Haddington. Whether you’re into pub grub, posh nosh or Indian delights, you’re sure to find something to delight your tastebuds.